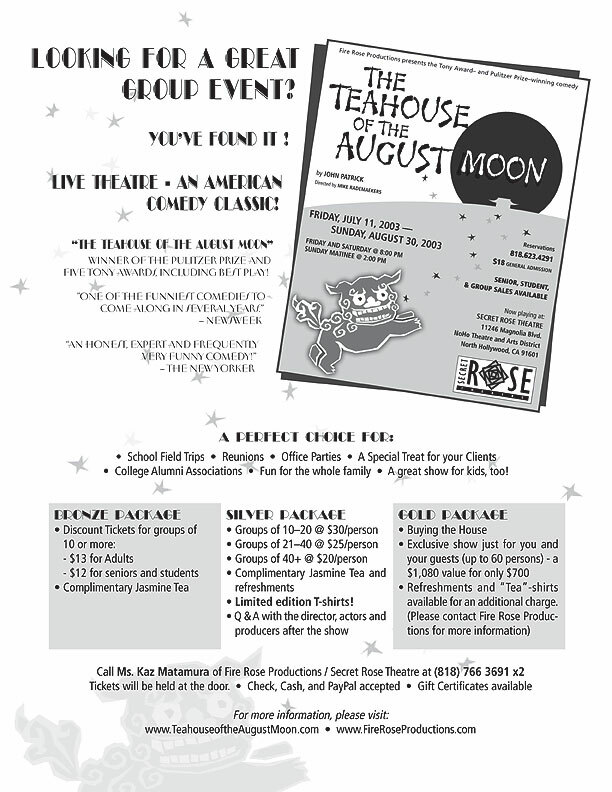 Fire Rose Productions' revival of THE TEAHOUSE OF THE AUGUST MOON closed its second hugely successful run on SUNDAY, AUGUST 31, 2003. Stay tuned for future information! Great seats available for all performances! Visit the Secret Rose Website for directions and parking information. Tickets can be purchased with cash, checks (made out to FIRE ROSE PRODUCTIONS), or PayPal. Tickets will be held at the door for pickup the day of the performance. We offer special discounted rates for groups of 10 or more. "Teahouse" is a perfect event for schools, churches, alumni associations, or groups of any size looking for a great time!